Obesity is one of the leading causes of various diseases and illnesses. All over the world, there are many people who suffer from obesity. It is just too difficult for some people to manage their weight. There are various reasons as to why it is not easy to manage one’s weight. Overeating is one of the reason. Just imagine the different delicious meals that are presented to you. Even if you admit or not, you will really be tempted to eat these foods. But apart from just having these meals, you should also consider the calorie content. Most food products and meals are oily and fatty. If you are already eating too much and you still have these kinds of food products then you will really suffer from obesity. What you are doing is that you overeat which can be a serious problem in the long run. When your food intake is excessive, it can be a major health concern. One of the reasons as to why there are many people who are overweight and obese is because most of them cannot control their food intake. Even if they have just finished eating their meals they would still eat something. This is not a good habit. But there are ways for you to avoid or to overcome this bad eating habit. This might be a bit difficult thing to do. But if you really want to control your food intake, you need to make sure that you eat on time and you eat the right food. There are several people who just eat whatever food they like and whenever they want. This is not a good thing especially if your metabolism is slow. When you have a diet plan, you get to monitor the foods or meals that you eat. In that way, you can evaluate for yourself. The reason why people overeat is because they always feel hungry even if they have just finished eating their meals. There are actually natural ways for you to lessen the hunger. Sometimes, your mental state can affect your appetite. Even if your body is not really searching for food, your mind would entice you to eat and eat. To feel heavy, you should drink lots of water. Drinking lots of water has several purposes. One is that you will feel heavy as if you have just finished eating a complete meal. Not only that but drinking plenty of water can also help you digest your food. If you really find it very difficult to control your food intake, there are products that you can use. For instance, you might want to have appetite suppressant drugs. This kind of product suppresses your appetite for food. As a result, you will not always feel hungry. However, you should not self-medicate. Before using any appetite suppressant drug, you should always consult your doctor first. There might be some chemical substances that would have side effects on you. But if you do not want to take up any drug or any supplement just to solve your problem then you always have the choice. At the end of the day, overeating is not just a physical state. It is also a mental state of how you view the different meals that are presented to you. For people who have fast metabolism, they can easily digest and burn the foods that they eat. But if you are not one of these people then you should consider your attitude and your attitude towards food. Sometimes, all you have to do is to say no. After eating your meal and you are suddenly presented with another meal that is really delicious then you have the choice. You can always say no. In that way, you are actually controlling your appetite and your food intake. When you sweat while doing exercises, you will realize how easy is to overeat and how difficult is to lose weight. This will also help you to keep a healthy lifestyle. By doing exercise, you will tend to lose calories and you won’t feel the appetite to have more food. Also, it will develop a desire inside you to have a healthy diet. Exercising will also lift you up from stress, depression and improve overall health. The more slow you eat, the more likely you will feel satisfied. Also, it gives time to your body to digest the food and satisfy your hunger. When you are having your food, try to keep away yourself from distractions. For e.g. : if you are watching your favorite show on TV while having dinner, its more likely that you won’t pause while eating and tend to eat until it gets difficult for you to digest or if you’re in a hurry, you will fill your mouth with whatever you get. Yes, just stop carving yourself. If you have a box full of chocolates in your home, it would be difficult for you to not to have them. Similarly, a kid would feel desire to have bag of potato chips or fruits, if he/she sees them anywhere at home. The simple solution is to put them away in the cupboard so that you can’t see them whenever you enter the kitchen. Preferably, buy only that much quantity that you can consume. Don’t buy in bulk. This would help you to avoid overeating. Eat nutritious foods that you enjoy and don’t eat snacks, desserts, chocolates that make you feel carving for them. We human beings tend to eat a lot to deal with boredom. Mindless eating is of the main cause of overeating. Sit down and think of anything that you are passionate about. Develop it as your hobby. If you have interest in writing, you can take blogging as your career or if you have deep interest for paintings, then join any painting classes. Your hobby will keep you busy and you won’t find a need to refuel yourself. Eating can divert a person’s mind and can be a helpful toll to avoid stress. Try to find some alternate sources whenever you are in angry or sad. There could be number of ways to avoid binge eating like talk to a friend, hand out with friends, write down notes in your personal diary or go out for a movie. 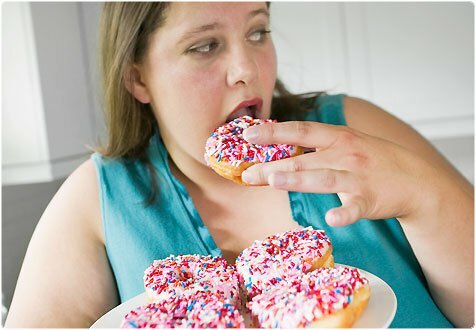 Emotional eating will slowly and slowly lead you towards obesity. If you have the habit of skipping breakfast every morning, then it is a sure shot cause of your over eating. When you have your breakfast in morning, your stomach gets full and you will eat less through out the day. Moreover, plan to have something after every 3-4 hours. This way you body gets time to digest the food instead of having 3 big meals in a day.